The first ever comprehensive book on the development of “Education in Bhutan” was launched in the capital, yesterday. 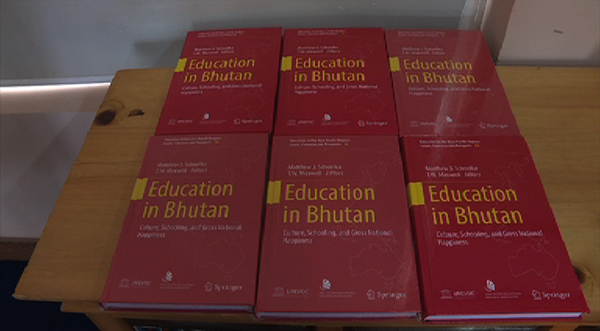 Students and academic researchers in Asia-Pacific Region will now have a reference book on education in Bhutan ranging from monastic education to non formal education. The book titled, “Education in Bhutan, Culture, Schooling, and Gross National Happiness” is the complete documentation on the development of education system in Bhutan. It presents history and development, challenges and the opportunities that are in the Bhutanese education system. One of the editors and authors of the book, Matthew J.Schuelka said, the book is an excellent contributions to international education. He added that the book will serve as a guide for those interested in learning about education and schooling in Bhutan. It will also be a benchmark where other books in future will be judged. The book was written based on research done on the education in Bhutan. Twenty authors, mostly Bhutanese contributed to the different chapters of the book. It was published by Springer Publishing Company in Singapore.